Tuesday • September 11 • 2012 Volume 79 • Number 37 INSIDE: Bomgaars ? Sears ? Menards ? Campbells ? Employment ? Dining ? One In A VerMillion ? Presorted Standard US Postage Paid Permit #8 ECRWSS Vermillion, SD bp Broadcaster Press Postal Patron Local Since 1934 201 W. Cherry ? Vermillion, SD 57069 ? Phone: 605-624-4429 ? Fax: 605-624-2696 ? www.broadcasteronline.com DON’T LET OUR NAME FOOL YOU! ndreds of ck! •Hu s In Sto Firearm •Thousands of Rounds of Ammo •Boots & Clothing •Reloading Supplies •Decoys & Blinds •Optics and Scope Mounting •Gun Safes, Hand and Soft Cases •Gun Care and Maintenance Supplies•Knives & Tools AR-15 Scoped Rifle Packages STEVAll Calibers $ Fire ENS arms starting at starting at 319.99 tguns Sho •Pump •Auto •Over & Under •Side by Side •New & Used •All Gauges 659.99 $ ndguns Ha •Revolvers •Autos •New & Used “Where the Buck Stops and the Hunter Shops! 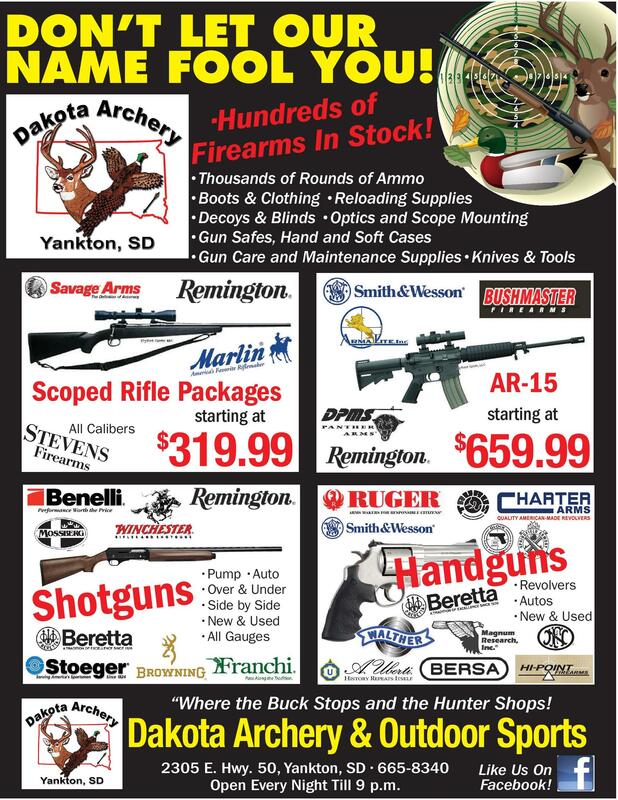 Dakota Archery & Outdoor Sports 2305 E. Hwy. 50, Yankton, SD • 665-8340 Open Every Night Till 9 p.m. Like Us On Facebook!